DDanny Turner is a Global Senior Vice President of Creative Programming at Mood Media. Danny has over 25 years of experience in the industry, including helping launch XM Satellite Radio, or creating programs for the likes of Starbucks, MTV, VH1, United Airlines, and Oprah. At Mood Media (a company which acquired Muzak, the inventor of background music), Danny and his team of over 65 music curators design custom playlists for some of the biggest brands, like Target, CVS, McDonald’s, Whole Foods, and many more. With 500,000 active client locations around the globe, and Mood’s playlists reaching 150 million people per day across 40 countries, Danny manages what can truly be called one of the largest music networks in the world. 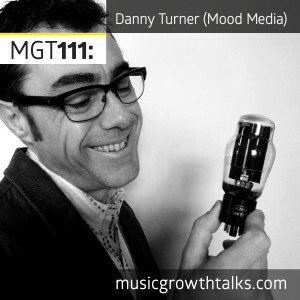 On this Music Growth Talks episode, Danny explained how music affects retail experience, and how they select music designers (one of the coolest jobs in the world). He also described his approach to creating unique music experiences, and what we liked there was that his team is not attached to certain artists or genres when building their playlists. They pick whatever will work for each brand, which gives them complete artistic freedom – great news for indie musicians. To put it in Danny’s words, “I don’t program by the charts”. Listen to the show to also learn which mistakes to avoid when making submissions to Mood or other licensing company, and to hear about Danny’s experience being one of the founding programming executives at XM Satellite Radio.